stuff that's hidden in a view by other entities?" 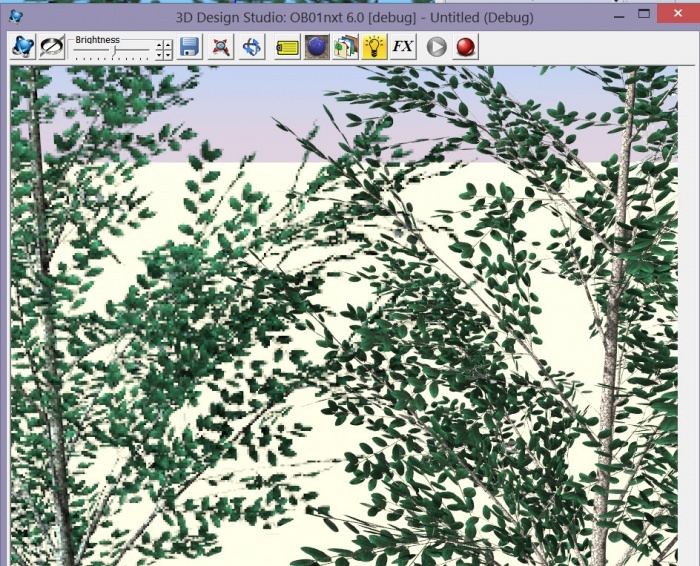 Everything in the models takes time to render, so we recommend you use images for background trees, and only use fractal trees for tree for which the additional detail will make a difference. The 3D Fractal Plants show more and more detail, the more you zoom in on them. But for plants which are in the background, the 2D images work well and save considerable rendering time. Here is a rendering of two plants - zoomed in - the one on the left is rendered as a 2D image, the one on the right is rendered as a 3D, Fractal plant. If you look closely you can see the better detail in the 3D, Fractal plant. However, when these two plants a zoomed out a bit the difference is almost not noticeable. Sounds like good method... something I need to look into as I've never used tree images. nXt doesn't really work like that-- all of the objects need to be taken. An object which is hidden from view may show up in a reflection, a shadow, refracted through glass, contribute to diffuse reflection of light in the scene, etc..
OTOH turning off objects which don't participate does not usually save a lot of time unless you are in a low-memory situation.